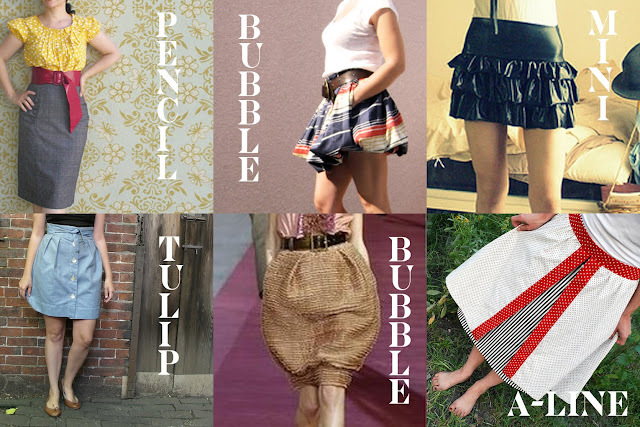 Grosgrain: What skirt are you? This reminds me of those Myspace widgets that define you as a Converse shoe, cocktail, or a Disney Villain. I would definitely be an "A-Line". Entering the Shabby Apple 'Dare to Design' contest has really opened my eyes to what I tend to lean toward in my designs. But looking at all the various shapes makes me want to broaden some of my work in the future. I was looking at a lot of skirt types. As I mentioned before, I tend to favor A-lines. I like their feminine appeal. I think they flatter the waist and look good paired with a generous bust. But there are some other good types out there. Like tulip and pencil. I thought I'd share with you some of these looks so you can also be aware of them when you're choosing a dress. I've seen many magazines and online articles recommend certain shapes for certain body types but I'd like to say that I've worn and been pleased with 'almost' every type on myself. I don't think that there's any specific shape that looks good on a specific type. It all depends on the skirt itself. The Tulip -Recognise the upside-down tulip shape. A tulip skirt gal would be sweet and shy. The Bubble -Puffy, voluminous skirt whose hem is tucked back under to create a “bubble effect” at the bottom. Sometimes the hem is the same width (more or less) as the waist, giving the illusion of a bubble. A bubble gal would be social and outgoing. The Mini -No explanation needed since we all must have one in our closet somewhere. I haven't worn one of these since my last trip to the beaches of Key West before my daughters were born. Regardless of whether it flatters my short figure, it just wouldn't look appropriate unless I was sunbathing on a beach close to the equator. A mini gal would be edgy and youthful. The Pencil -High waist, hugs hips and goes below the knees. A pencil gal would be hard working, smart and driven....maybe even sultry? The A-line -The name says it all. My favorite type of skirt and a staple in my closet because it's just so flattering and girly. An a-line gal would be flirty and feminine. A-line for sure! In fact I have fabric ready to cut to make that apron overlay in the picture...I love it. I am definitely an A-line...I think I have five in my closet. My aunt-in-law asked me the other day when I stopped loving my dresses, and I looked at her and said, I would still wear a dress everyday if I could! But you know what I haven't bought one for myself in a very long time...a feel a new obsession coming on! I love A-line skirts as well, they are very flattering! I do like to admire other styles on people besides myself. by day I'm an A-line, but by night, I'm a sultry, sophisticated pencil skirt! I have to go with the crowd on this one. I like A-line skirts. I also like one with a little flare at the hemline. I wore the minis for sure when I was a teen, but those days are long gone. I don't need to add to my already bubble behind with a bubble skirt. I wore pencil skirts when I had a pencil body. Tulips and I never got along. Pencil skirt....BUT totally wish I was that mini!!! Very much an A-line. I've always loved the look of them. I also like the look of the pencil and wish I had one ... maybe someday. I'm definitely a pencil skirt gal myself, with a little A-line. So that means I'm sultry and feminine...Nice! Now if only I could live up to that! A-line for sure - as long as they're short enough not to dwarf my vertically challenged legs! A-line AND Pencil. Can I be two? A-line at home, Pencil at work? I'm amazed that given how many people define themselves as A-line gals that designers would even bother making anything else! I too am an A-line girl, but the tulip has serious retro appeal.